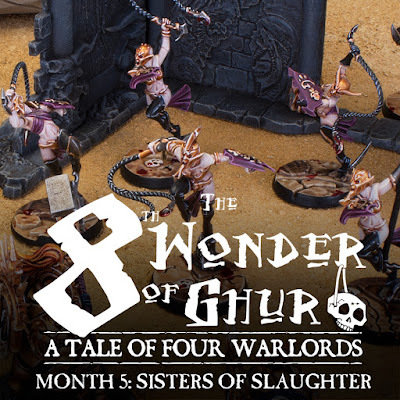 After venturing into some of the more esoteric choices in the Daughters of Khaine army over the past few months, it was time to add a classic staple; the Sisters of Slaughter. While these balletic psychopaths are fairly similar to the Witch Aelves in terms of painting, they do add their own little flourishes and touches. When I was planning out this army for painting, I purposefully spaced out the Witch Aelves and Sisters of Slaughter since they are so similar to each other. I have heard the tales of hobbyists going mad after painting 90 Witch Aelves, and wanted to avoid that. By breaking them up be doing the Witch Aelves early, and then painting some of the other unit choices I was able to approach the Sisters with a fresh head. I did the same thing with my two melusai units, painting the Blood Stalkers in month three, and saving the Blood Sisters for February, month six. This way I was able to keep my interest in the army from waning and help avoid that dreaded burn out. In terms of painting, the Sisters of Slaughter are tackled in pretty much the same way as the Witch Aelves. In fact, you can follow my guide for them and you'll have all the tools you'll need for this unit as well. In some areas they go a bit faster, such as not having any detailed faces to paint, or larger hair, but in others they take a bit longer, mostly with the whips. I made the choice on my first Sister of Slaughter model to line highlight every ridge on the whip. It's not very hard, but it does take a little while. These models probably have the most of my army's color out of the whole army, since their shields are also painted Screamer Pink. For the banner, I was originally going to use the same symbol as I have on my Witch Aelves' banner plus the two smaller ones, but as I was applying the transfers I had to take the larger eye icon off due to the transfer wrinkling. When I looked at it with just the two smaller symbols I decided I liked it as it was. This way it was different enough visually from the other banner, and also had a cool minimalist look. With the clock ticking down I'm fast approaching the end of the Tale of Four Warlords. I'm currently painting up my final unit, the Blood Sisters, and I'm also starting to prep my display board. This will probably end up being done in March in the lead up to Adepticon. I'll also need to get a few practice games in with the Daughters of Khaine beforehand so I can have a good grasp of the rules. I'm excited to get them on the tabletop and see what they can really do! Left. Right. Left. Left. Strike. Right. Left. Right. Strike. Strike. Flourish. A massive cleaver parted the air a hairsbreadth to her left, an area that Nesos had been occupying only a moment earlier. 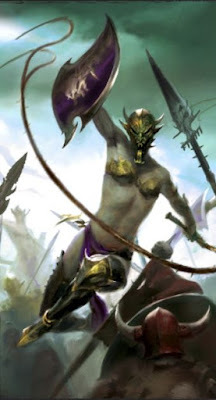 Bounding from one foot to the other, she launched herself into the air, propelling herself off of the orruk's crude weapon. As she twisted through the air above the greenskin's head, her whip lashed out, coiling around the corded muscle of the orruk's neck before planting her feet upon its back. The bladed dagger at its end sunk into the green flesh, and with a flick of her wrist the whip uncoiled, sawing through the orruk's neck. As the beast's head spun away on a crimson arc, Nesos flipped off of its broad shoulders and landed once more amongst the melee. All around her her Sisters fought, a riot of pale flesh and blood amongst the press of green bodies. Knocking aside another attempt on her life with the bladed buckler strapped to her left arm, Nesos picked her next target. Oh, how the crowds would have roared for her performance. If only they could see the graceful pirouettes and delicate murder she wrought upon the beasts of Ghur. The tragedy of her art going unappreciated quickly fled her mind as a new masterpiece began to take shape. A new offering to Khaine even more glorious than the last. Bladed whip held fast she spun once more into the swirling combat. Left. Right. Right. Strike. Left. Strike. Right. Strike. Flourish. 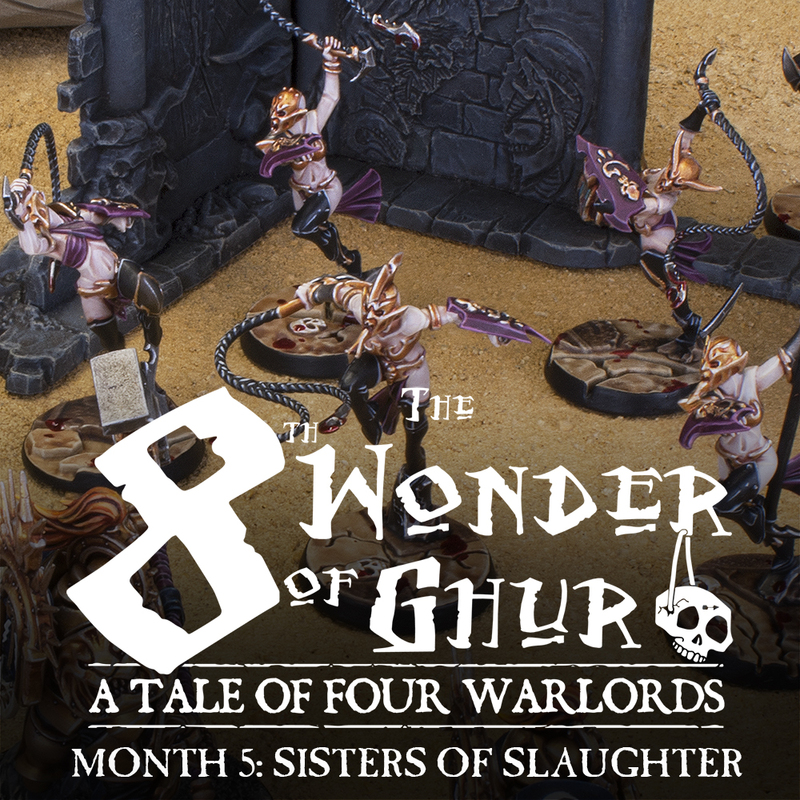 Be sure to check out the latest addition by the other members of the Tale of Four Warlords, Eric's Drukharidron and Mitzy and Jimbos' Grots and Stormcast!